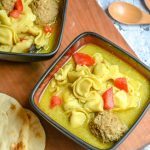 A creamy, curried soup this version is quick & easy and is infused with the flavor of beef meatballs, tender tortellini pasta, and sweet chopped tomatoes. In a dutch oven, or other large soup pot, sauté the onion until soft and tender. Season with the curry powder, add in the garlic, and continue cooking an additional minute. Stir in the chicken broth, and bring the mixture to a boil.